- There is insight missing. These context/input metrics are not enough, and the output metrics are also not enough. - I steered away from using relGF% and individual points due to sample size, but if there’s a player who is torching points at home and silent on the road, could be worthwhile digging in there, as well. At the time I sat down to draw up this blog, the Rangers have played 28 games on the season under David Quinn. Their record during home games, a more than respectable 10-4-1. On the road, however, they fall to 3-8-2. Among NHL teams, this is the most egregious difference between home and away record. Uncertain as I am that there is a clear way to figure out why this is happening by just using data, I wanted to take a look anyway. 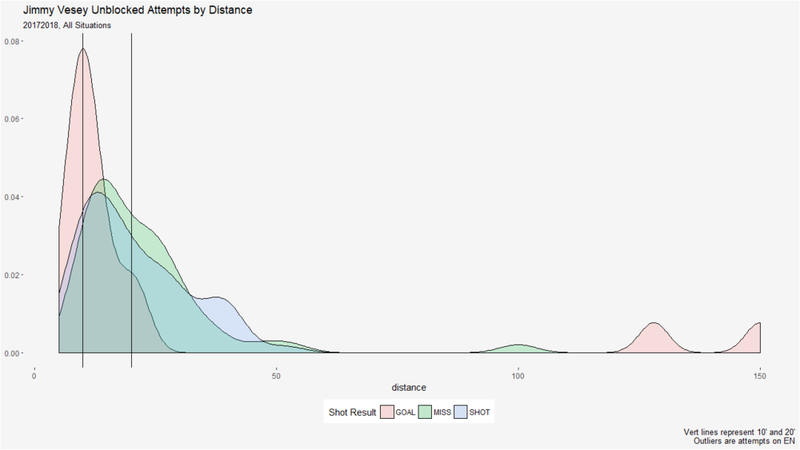 We’ll start with context metrics like TOI%, Zone Start Rate, Quality of Competition and Teammates, and then finally output metrics like relCF% and relxGF% - and a brief analysis of what I think each visualization tells us. First, Time on Ice Percentage. Really nothing to dive into here. Quinn is giving basically equal amounts of TOI during both home and away games. There are a couple of players who find themselves ‘off the line’. Chytil seems to play more at home than on the road and Andersson vice versa, but this could very easily just be sample size oddities. Next, Zone Starts. Hopefully begin to see some changes here where the difference between first change and last change may come into play. And differences we see. Names that stand out for more offense on the road than at home: Andersson, DeAngelo, Howden, Vesey, Smith. For the opposite, more defensive zone starts at home than on the road: Zibaenjad, Staal, Pionk, McLeod, Buchnevich. These are names we’ll have to keep in mind when we start looking out more performance related metrics, but, we continue with context. Quality of Competition. My anticipation is that we see more discrepancies here than we do with Quality of Teammates. Quinn can control his five-man units much more easily home and away than he can who his players line up against. 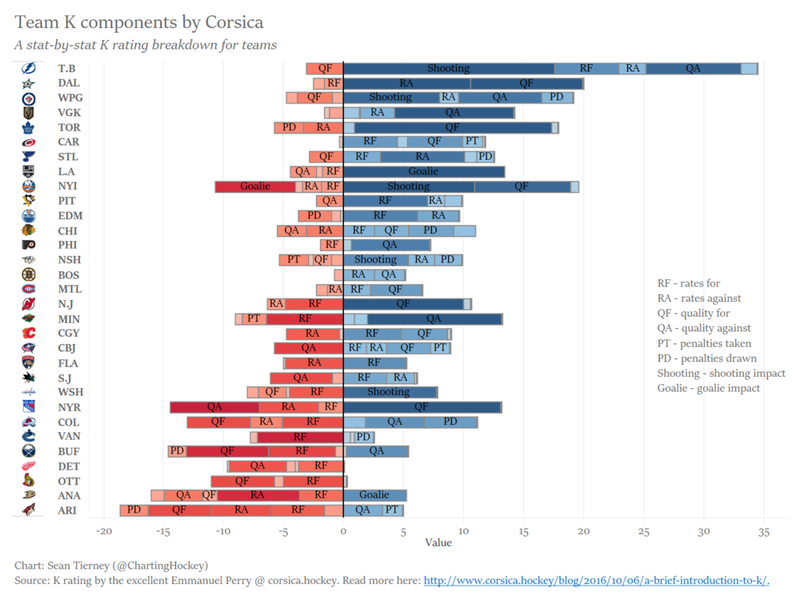 Both metrics of quality we’ll be using are based on Corsica.Hockey’s xG model. One thing I love that this visualization shows, that admittedly I forgot it would. Look how bunched together a lot of these names are. The differences in Quality of Competition are much, much lower than we expect them to be. It’s not as easy as Staal and Pionk always out there against the other team’s top opposition. At the same time, these bunched together data points are going to limit the oddities that we do see in differences between home and away, which should’ve been anticipated by me, but alas, wrong again. Of course we have some major outliers here like Andersson, Claesson, Vesey, Zucc, Buchnevich, and McLeod. Otherwise, I’m not entirely certain if there’s anything we can discern from this besides continuing to realize that the differences in QoC are small. Now the same, but with teammates. This, as anticipated, is very similar to the zone start rate visualization. This is something that Quinn has full control over for both home and road games. It doesn’t matter what the opposition coach does because Quinn controls what five man units go onto the ice. It should be highlighted though that the bunching of players here is far more spread out than the bunching on the same Competition based viz. Biggest item that stands out to me here is Pionk, who both on the road and at home gets fed the easiest usage in terms of Quality of Teammates, which will be important to keep in mind in the now coming output visualizations. Relative shot attempt percentage. Keeping in mind that this metric tells us the difference between an individuals shot attempt percentage and the shot attempt percentage of the team when that individual is not on the ice. This same methodology is used in the second visualization, Relative expected goals percentage. Neal Pionk: Best teammates, bad output. Gotta love it. Andersson: Bad both on the home and on the road, worse at home. DeAngelo: Positive in both venues, better at home. Buchnevich: Great at home, bad on the road. Andersson: Better on the road than at home. DeAngelo: Negative in both venues, worse on the road. Smith: Both negative, but about even. Zibanejad: Great on the road and bad at home - interesting. Staal: Positive both, about the same, this has been a good exercise for Staal. Pionk: Better numbers than on relCF, but still a negative player in both venues. Buchnevich: Negative in both venues, about even. In summary, i t’s probably worthwhile to create a quick data table that looks at TOI% and relCF% and relXGF%. Pionk and Staal get caved on the road. I’m not sure if it’s as easy as just saying: well, play them less! But, it is something to keep an eye on during road games. The Staal-Pionk imapct is somewhat mitigated on home ice where they’re, still bad, but not a complete waste of ice. Hayes is really, really good. Imagine what he could do with proper QoT? But that seems to be changing tonight as he suits up at the wing with Kreider and Zibanejad. I’m interested to see how that goes. Ultimately, there wasn’t a ton of insight here to get some information. The home/road splits for the Rangers were equally as terrible under AV last season, 21 wins at home and only 13 at home. This, a major difference from the year before, with 21 home wins and 27 road wins. Perhaps it’s just randomness at work and small sample sizes. Ultimately, besides overplaying Staal and Pionk on the road, it is seemingly difficult to explain via context the differences in success. Now, in AV's defense here, when the team you coach is 30th in the league in shot attempts against per 60 minutes of 5v5 play, well, you can't really go on record saying that you care about it or coach it because, well, you're terrible, and that wouldn't be a good look for you. But this isn't really a good look for the Rangers, either. The studies are essentially conclusive at this point. Shot attempts, Corsi, is the foundation of the analytics movement. 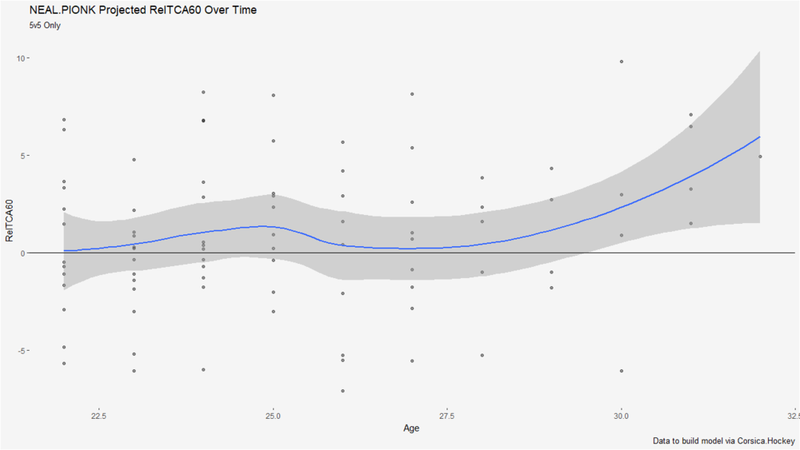 CF% is a better predictor for future team success than scoring chances, some xG models, and actual goals. These are all things we know, and the debate on these should be behind us at this point. Then, you see a quote like this from a respected coach in the NHL, and we get set back. 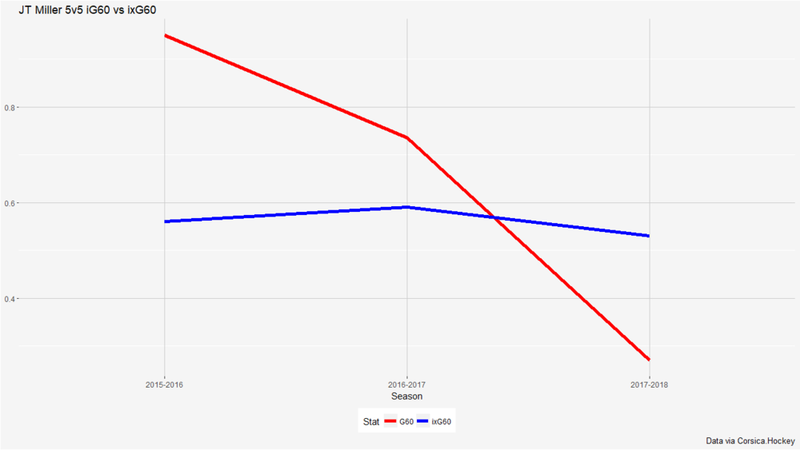 Let's see if we can figure out what the Rangers do value in their `sophisticated` stats package, and let's see if we can do it using only the data available on Corsica.Hockey, publicly available data. Obviously we won't know for sure, but let's see what we can infer. Above, I've bolded the highlights. What can we infer? The Rangers don't care about quantity, they care about quality. But, the damage they're doing to themselves on defense with the quality against they allow is partly cancelling out the good things they're doing on offense to generate the quality shots. Can one exist without the other? I think this is AV hockey in a nutshell. Sacrificing defense for offense. The man-to-man scheme that the Rangers employ in the defensive zone allows for quick breakouts, rush opportunities, odd-man rushes. But, it leaves Lundqvist and Pavelec out to dry, and if they aren't making the saves, and the Rangers aren't finishing their chances, the score gets ugly. Luckily for the Rangers, their goaltending duo has been carrying the load and masking a lot of the defensive deficincies we see with our eyes and on the stat-sheet. The visualization displays what is discussed above. The Rangers strength lies in the quality they can generate for themselves. The Rangers weakness lies in the quality against they allow. The system? Further, we need to debate sustainability. What's more repeatable, quantity or quality? If you're coaching to quality, as the Rangers clearly are, are you playing with fire? To isolate what teams are generating in terms of quantity versus quality, we'll be exploring split CF/60 (a measure of quantity generated) and split xFSh% (an isolated quality metric based off of Manny Elk's expected goals model). I'll also be using a split-half of last season's games in order to get more data. On the visualizations above, the blue line represents the line of best fit via a linear model, the gray line is a simple x=y line. Basically, the visualizations show us what we know, what we've known since the beginning of the movement. Shot attempts have a very strong repeatability. It's a skill. We don't see the same strength in shot quality. Flaws in the above: The sample size is way, way too small. To make a stronger point, we should analyze and chart these splits for each season going back to 0708. I didn't do that. I should've done that. Thus, if you're coaching to quality rather than quantity (or a strong mix of both, which is pretty clearly the best option), then you're playing with fire. This `sophisticated` stat package that the Rangers are boasting essentially seems to boil down to what the Rangers thought they were getting when they originally hired John Tortorella, safe is death. Now, 35 year-old Lundqvist is still producing as one of the best goalies in the league (8th in the league in goals saved above expected per 60 among starters), and the system and stats-package that the Rangers and AV are utilizing is exploiting that fact. And maybe they should be, but there is a serious lack of quantity, and we see that relying on quality isn't as sustainable. Further, noting again how reproducible quantity is, we see the Rangers being nearly dead last in the league in terms of allowing attempts against. Unless the system changes, well, there's no end in sight for this. We can debate endlessly the types of players that we think the Rangers are missing, specifically in my opinion, a RHD to pair with McDonagh that is an undervalued shot suppressor (think Connor Carrick in Toronto, Josh Manson in Anaheim before people woke up, etc...), and perhaps maybe a winger in the mold of Benoit Pouliot circa 1314 to complement our centers and make sure the game is going in the right direction. But if the system isn't going to change, or if we're going to bring these types of players into the fold just to find Carrick in the pressbox instead of Steve Kampfer, then what's the point? The `sophisticated` package and system are played out. We see it every single year. The Rangers launch themselves into the playoffs via a ridiculous PDO, and then the game tightens up, the refs swallow their whistles, there's less space on the ice, there is less opportunity for rush attempts for. The game clogs. And what do we see in the playoffs? Lundqvist left out to dry, because that's the system, and the offense disappears. Rinse and repeat, but `sophisticated`. Two blogs in one month brought to you by: Me needing to kill vacation time at work so I don't lose the hours. All stats for this blog provided by Corsica.Hockey unless otherwise stated. Chances are if you got into a discussion about the New York Rangers and JT Miller, you'd hear a lot of praise. On the surface, the 24 year old C/W has 24 points, good for 2nd on the team. He's been utilized across the forward lines at all positions by the coaching staff. He's trusted, and they like him. Maybe they should. But what happens when you dig deeper into those numbers? For starters, his goal scoring has become a concern. Despite two goals in the last two games (one an empty netter, but at the end of the year, a goal is a goal, and no one is being picky about them in contract negotiations (cc: Michael Grabner's agent)), Miller is still struggling. Of his six goals this year, only 2 have come during 5v5 play (12th on the team), for a 5v5 goals per 60 rate of 0.27 (last among TOI qualified forwards on the team). The reason for JT's goal scoring downfall is no mystery, he's not shooting nearly enough. At an individual shot attempts per 60 of 9.07, the only forwards on the team who attempt less shots than JT are Desharnais, Nieves, Carey, and Fast. If we dig slightly further into JT's point total (back to all situations), we discover that half of his 18 assists are secondary. The only issue with this is that secondary assists are less repeatable than primary assists. They are given out less often, and are far more subjective on the scoresheet. A point is a point, but a primary point is a bit more important. Now. It is important to keep in mind that JT's shooting percentage has plummeted this year, and GMs are extremely susceptible to trading low on players when their Sh% has a dip year (see: Stepan, Derek or Smith, Reilly). The million-dollar question becomes, what is JT's actual shooting %? Well, we can use Manny Elk's expected goals model to see where JT should be. JT's expected total sits just under 4 goals at the moment. The thing is, even taking into account his low shooting percentage, his expected total is also drastically beneath where it should be, and again, this falls back to the fact that JT Miller is not shooting the puck enough during 5v5 play. His iCF60 dipped from 15-16 into 16-17, but he kept up his shooting percentage, so the goals still came. This year, thus far, JT's shot attempt numbers have dipped again, and the shooting percentage has not been sustained. One more point on this is, was JT Miller ever actually a 14 or 13% shooter? Rephrasing: Is JT Miller's shot good enough to be a 14% shooter? Going back once again to Corsica's expected model, In 16-17, Miller outshot his expected rate by nearly 2%, in 15-16, that number was 4.5% Again, the million-dollar question: Do you bet on JT Miller reaching or exceeding his expected total again? How good is his shot? With this viz, coupled with the data tale above, we can see that in terms of expected goals, JT is essentially the same player this year than he has been in year's prior (slight dip), but, he's not converting. Is this because he's shooting less? It could be. Is it bad luck? It could be. That's the bet. Where do you fall? There are things that JT Miller does well on the ice, obviously. His versatility is important. Up and down the lineup, and across the line. JT is also a good, if not great, passer, and is adept at carrying the puck into the zone. But, he's not scoring goals anymore. And, he's never been a true diver of shot attempts. Securing a now barley positive relative shot attempt percentage this year after a -4% last year. JT is also failing at suppressing shot attempts against, operating at a +4.3 after a+6.62 relCA60 last year (the amount of shot attempts per 60 that Miller is on the ice for relative to the team when he is off the ice). There was a sneaking suspicion last year that it was Kevin Hayes bringing down JT's shot-attempt based metrics, but Hayes has rejunivated the strong shot suppression game we saw from him in 15-16, operating at -3.04 this year. It should be noted that JT, while allowing shot attempts against, is also still driving shot attempts for, with a +4.22 relCF60 slightly. JT is slightly outpacing his weak suppression with strong generation. What does this all mean and why is it important? Well, the Rangers are coming up on what is going to be a very important off-season in terms of the direction they want to take the team. Nash's $7.8m AAV is going to come off the books, and Jeff Gorton finds himself with four restricted free-agents to re-sign. JT Miller, Kevin Hayes, Jimmy Vesey, and Brady Skjei will all be in need of a new contract. Vesey can't really demand more than $2m AAV, so that's an easy one if the Rangers decide to make it easy. The big decisions will come at the table with Miller, Hayes, and Skjei. Brady Skjei should be bet on long-term. Kevin Hayes, if he continues his strong play from this season, should also get a long-term deal. But what do you do with Miller? JT Miller who has 6 goals in 33 games this season, 6 in 45 dating back through last year's playoff run, and 12 in 87 if you dial that back to last year's all-star break. This is a goal-scoring slump that is flying under the radar as JT continues to rack up A1s and A2s. Do you bet long-term on that banking on JT rekindling whatever it was he had before that had him outshooting his expected totals at the rate which he was? Coupled with the decline in his shooting rate?